How to Make Chicken Fajitas in Instant Pot – Easy Instant Pot Chicken Fajitas AND Vegetables Cooked Together! Now you can whip up juicy, tender, flavor-packed chicken fajitas without the steaming, sizzling pan… This instant pot chicken fajitas recipe lets you cook your meat AND veggies in the pressure cooker, at the same time—in under 15 minutes! All you’ll need are tortillas and toppings, and you’ve got an easy weeknight dinner ready to serve. 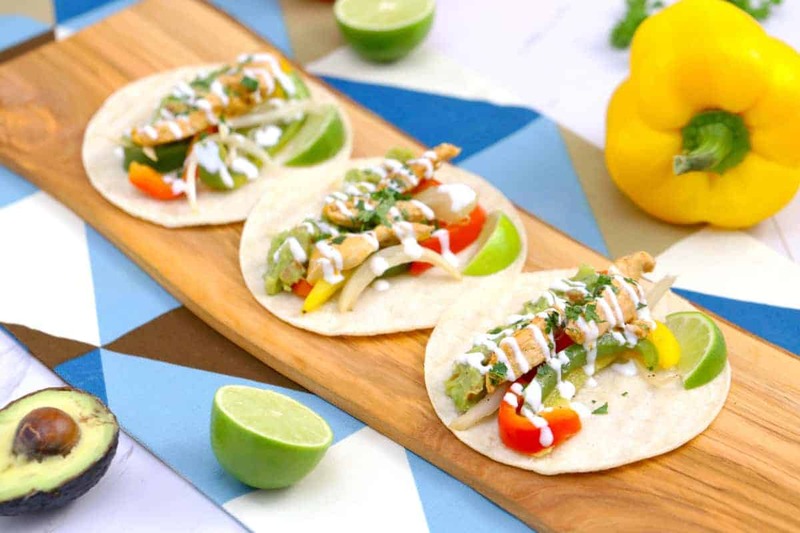 Or, skip the tortillas and serve up Paleo approved & Whole30 chicken fajitas instead! Don’t worry, these instant pot chicken fajitas are just as tasty as the classic recipe. 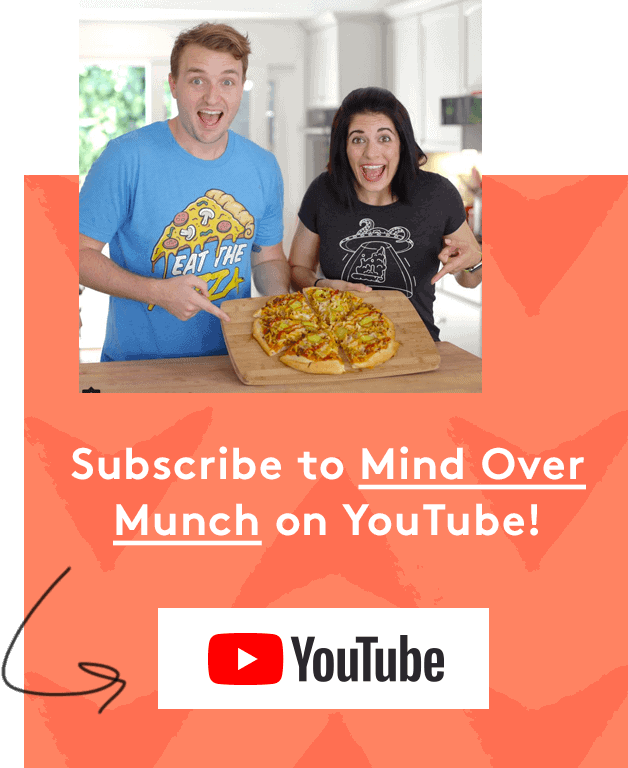 You’ll just spend way less time and effort in the kitchen making them! 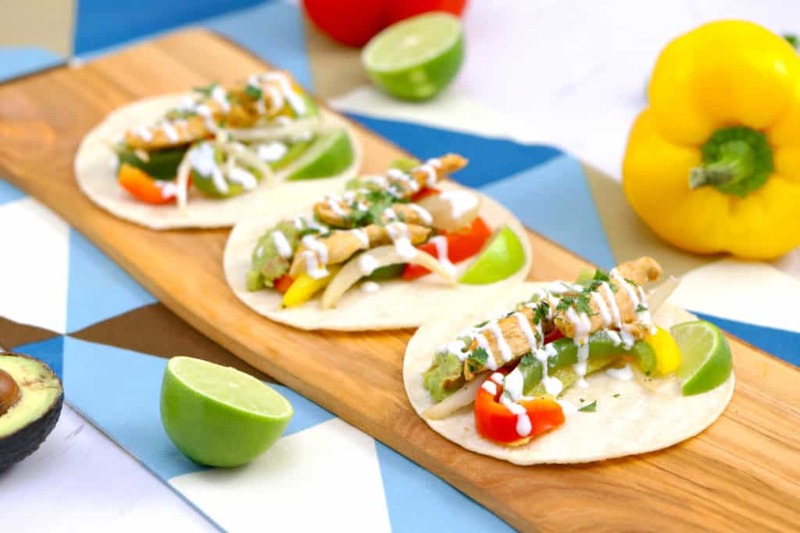 The chicken breast turns out so satisfyingly juicy, with that savory, zesty, fajita-flavor kick we all know and love. And the peppers cook through until perfectly tender but not soggy at all, with just a slight crunch. Seriously, despite the very short cooking time of most instant pot recipes, it surprises me how much flavor pressure cooking can pack into a dish! These instant pot chicken fajitas turned out so melt-in-my-mouth good—with a deeply-infused flavor that was almost like they’d been slow-cooked. But, I didn’t have to wait around ALL day for it to cook! Oh yeah, and did I mention this healthy chicken fajitas meal will FREEZE really well for later? Clean and wholesome, quick and easy, and totally freezable—safe to say this instant pot dinner is a meal-preppers dream. 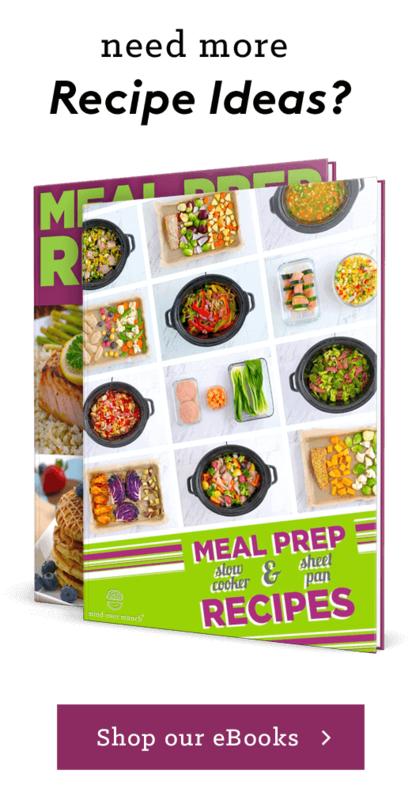 Healthy Instant Pot Recipes: 2-in-1 Weeknight Dinners! Part of the beauty of instant pot meals is the instant convenience. Just have your chicken marinating ahead of time (rather than running your slow cooker or crock pot all day), and you can toss it into the instant pot half an hour before dinner time! Plus, I absolutely LOVE the added convenience of 2-in-1 pressure cooker recipes. …Say whaaaa?! It is possible—with the help of an oh-so-handy instant pot steam rack! 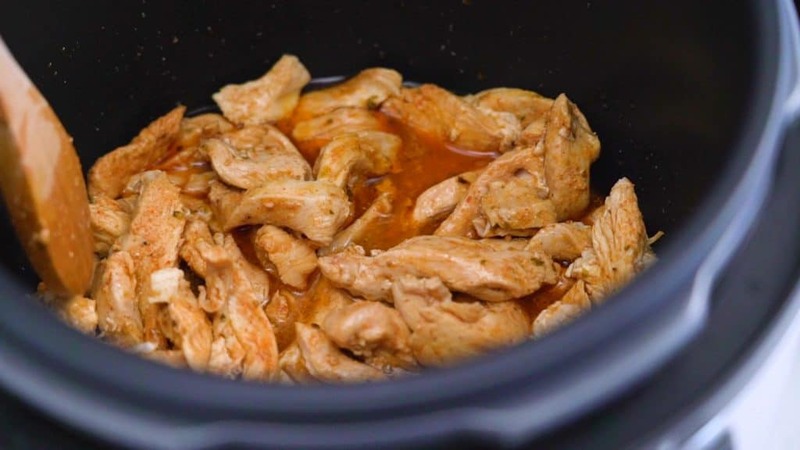 I’ll show you how to make chicken fajitas in the instant pot using my nifty 2-in-1 hack, and you can apply this trick to TONS of other instant pot meals. Whether it’s these instant pot chicken fajitas, or butter chicken and rice, or even spaghetti and meatballs in the pressure cooker—your 2-in-1 possibilities are endless! To start, you’ll need to marinate your chicken breast for a short while. A good marinade needs a bit of acid in it (like the lime juice in this recipe), because it loosens up the tightly-coiled proteins in the meat. That loosening makes room for some moisture and your flavorings to get trapped inside the meat—making these instant pot chicken fajitas even juicier and tastier! You can marinate in a dish or bowl if you like, or I personally prefer to use a large zip-top bag for ease and convenience. (And less mess!) 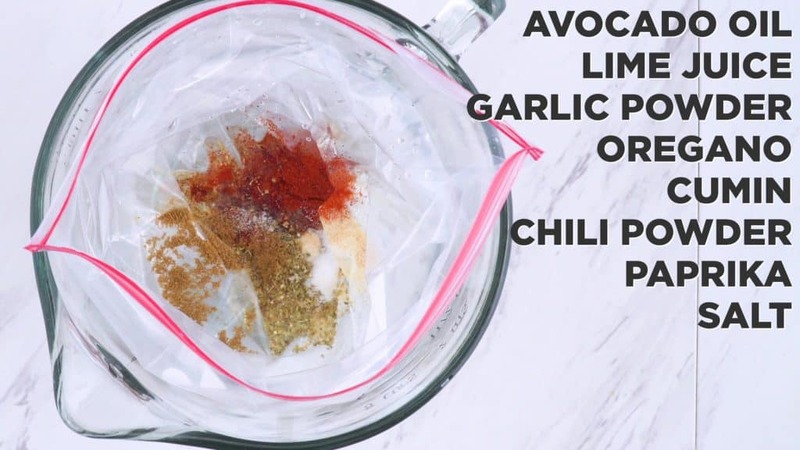 I just add all of my fajita marinade ingredients to the bag, seal it up, and shake to mix everything together. Then, add sliced chicken to the marinade and seal up the bag again, with a little air left inside. Give it a good shake once more so you coat the chicken thoroughly with the fajita marinade. 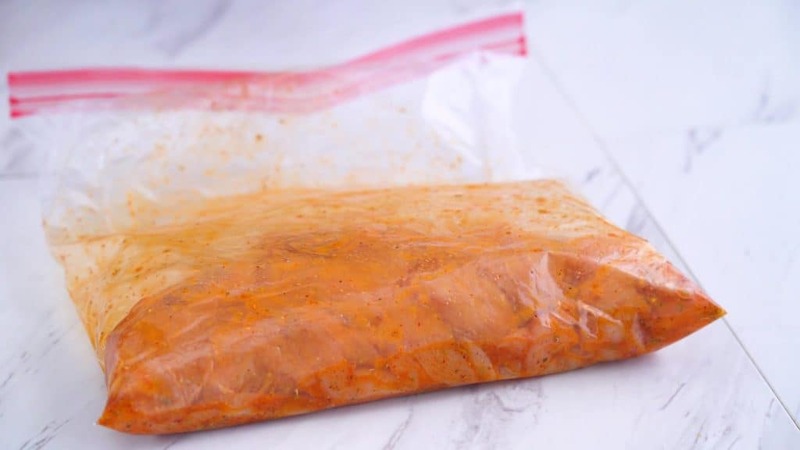 Finally, remove as much air as you can and reseal the bag—you want as much contact between the meat and marinade as possible—before storing in the fridge for 1-2 hours. Add all marinade ingredients to a bag, seal, and shake to mix. Add sliced chicken breast and shake to coat well. If needed, either for meal prep purposes or on busier days, you can also allow your fajita chicken to marinate overnight. But, I don’t recommend leaving it any longer than that! After about 2 days, meat left sitting in an acidic marinade can actually become tougher and drier as the proteins tighten up. Now, for the veggies—which you can prep right before you’re ready to cook. Some people make instant pot chicken fajitas simply by tossing their sliced veggies right on top of the chicken in their cooker and letting ‘er rip. Which you’re totally welcome to do! OR, you can cook your chicken and veggies separately with the neat 2-in-1 steam rack hack I’m about to show. So, for the fajita veggies made 2-in-1 style, you’ll need a large mixing bowl lined with a large piece of foil. You’re basically going to wrap up your seasoned vegetables in a foil pocket/pouch, so make sure you’ve got enough foil to wrap them up completely! Line a bowl with a large piece of foil and fill with sliced fajita veggies and seasonings. Add your sliced bell peppers and onions to the foil cavity, followed by your oil, seasonings, and lime juice. 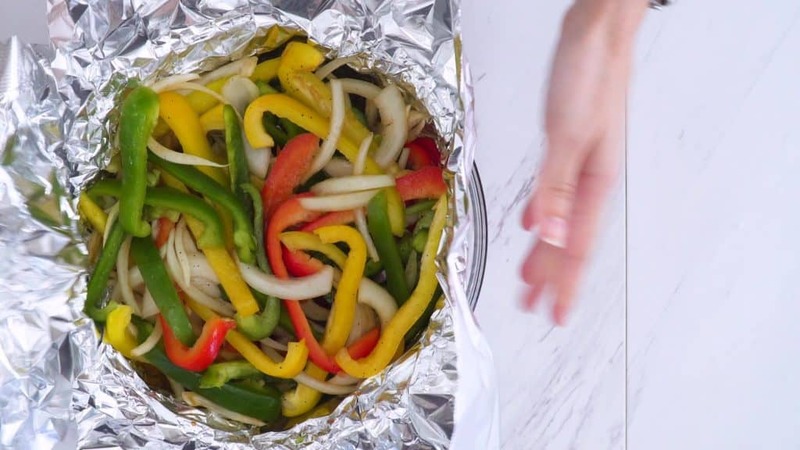 Give it all a good toss with your hands to coat well, then fold the edges of the foil together to seal up your foil veggie pocket. 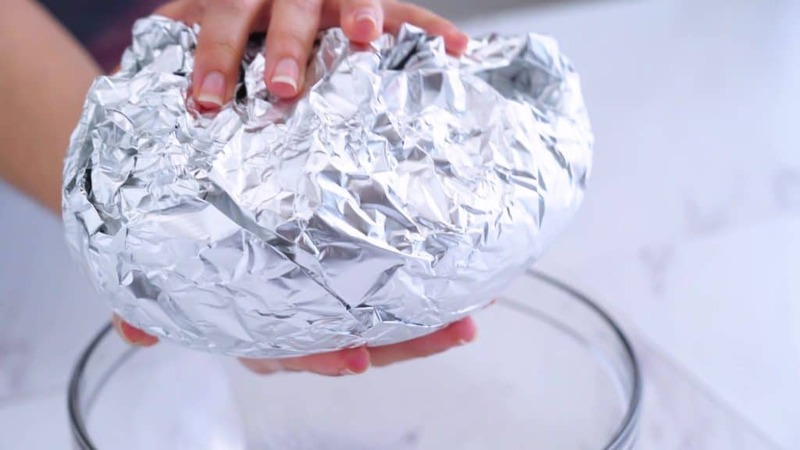 Toss with hands to coat well and fold edges of foil together. Seal up fajita veggies to form a foil pocket/pouch. 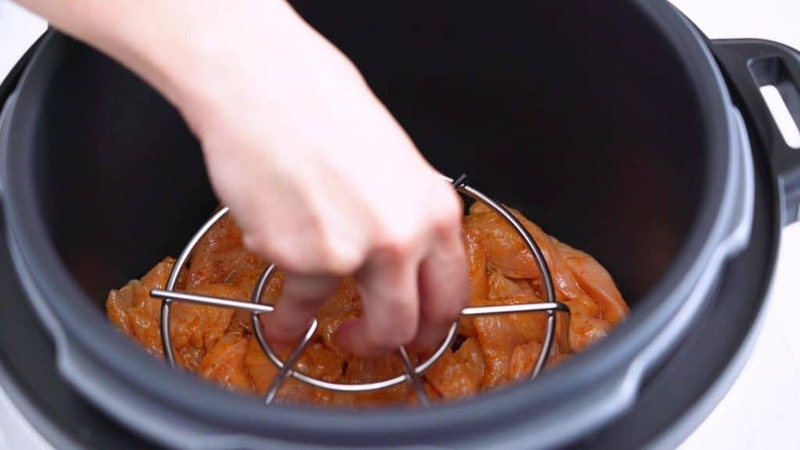 With your bag of marinated chicken, pour both the chicken and the rest of your marinade into the instant pot. Use a spoon to arrange the chicken pieces in a flat/even layer, making room for the most magical of 2-in-1 tools: an instant pot steam rack. When making chicken fajitas in the instant pot, simply place your steam rack into the bottom of the cooker so it’s hovering over the chicken. You want the rack to be touching the bottom of the pot, but tall enough so it’s not crushing your meat. Then, add your foil pocket right on top of the steam rack, and you’re ready to cook! Place steam rack into bottom of cooker, tall enough so it’s not crushing chicken. Add foil veggie pocket on top of instant pot steam rack. 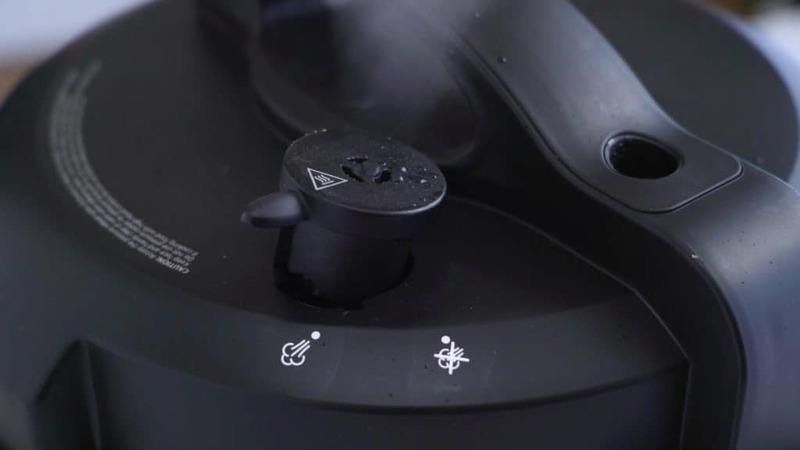 Close up the lid of your pressure cooker and cook on your machine’s manual setting at high pressure for just 7 minutes. Easy-peasy! Granted, it will take a few extra minutes to heat up before the pressure-cooking actually begins, but overall this recipe is SO quick and easy thanks to the magic of the instant pot. Quick note: I have a Crock-Pot brand pressure cooker, not the official Instant Pot brand, so I access my manual setting with the ‘BEANS/CHILI’ button. 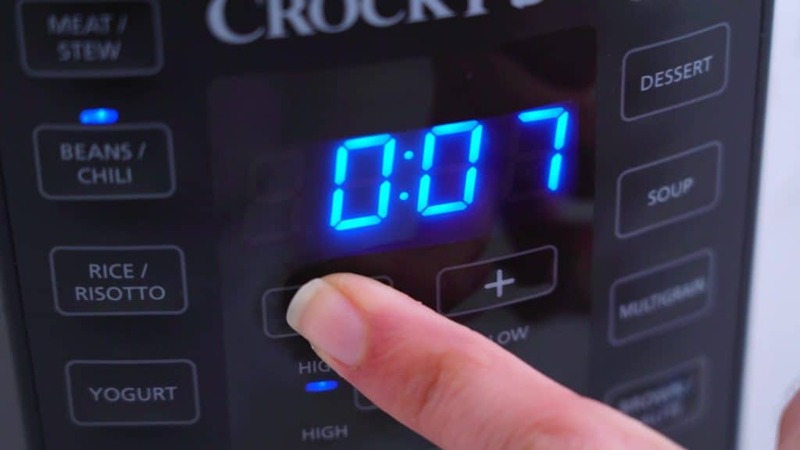 This may be different for your cooker, depending on the brand/model, but just check your machine’s instructions or the brand’s website if you need help! After the 7 minutes of cooking has finished, turn off the heat but don’t open up the lid just yet. First, flip your Quick Release valve and let the steam release for 6 minutes. Cook on manual setting at high pressure for 7 minutes. After cooking finishes, quick release steam for 6 minutes. Even after the steam release finishes, be careful opening the lid because it will still be very hot and steamy! Grab some oven mitts or kitchen towels to protect your hands while you remove your foil veggie pocket, followed by the steam rack in the bottom of your cooker. Underneath, you’ll find your juicy, HEALTHY fajita chicken ready to go and perfectly-cooked—in just about 15 minutes! Use tongs or a spoon to remove the chicken from the cooker, open up your foil pocket full of tender fajita veggies, and it’s all ready to serve straight out of the pot. Remove foil pocket and steam rack to reveal cooked fajita chicken. 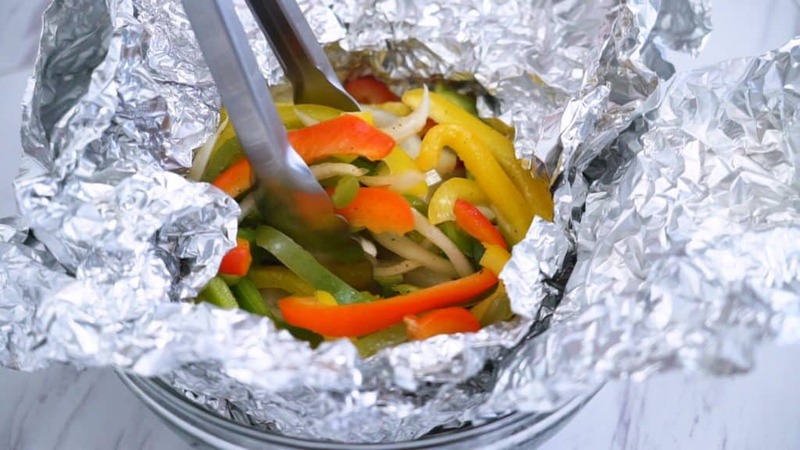 Open up foil pocket with cooked fajita veggies and serve as desired. Serve it up buffet-style for the whole family with tortillas and your favorite fajita fix-in’s, so everyone can customize their own meal! It doesn’t have to be complicated—I’m a big fan of guacamole, sour cream, and a squeeze of lime juice, but use whatever you enjoy. Or, allow your chicken and veggies to cool before storing in separate containers in the fridge for the week. 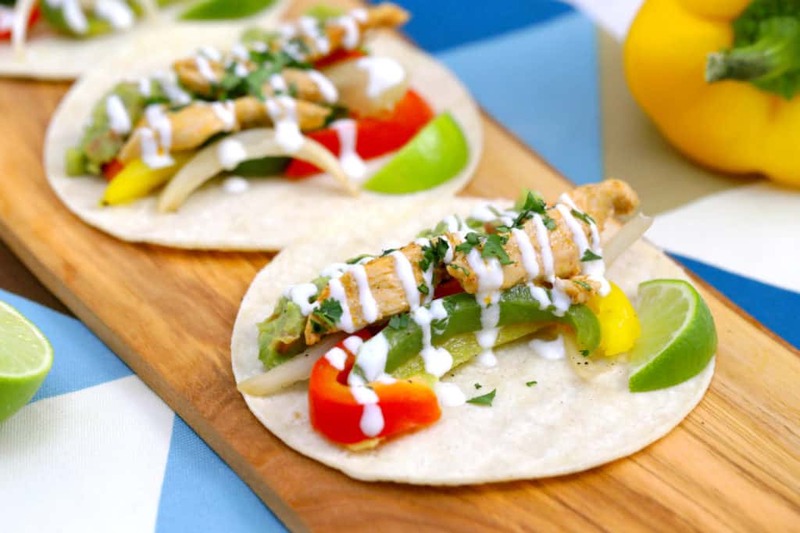 Substitutions: Do I Have to Use Chicken Breast in this Instant Pot Chicken Fajitas Recipe? Absolutely not! Chicken breast is a great option for this recipe if you’d like to use it—it slices up easily, it stays tender and juicy in the instant pot, and it makes for a protein-packed dinner. But, you can also use chicken thighs, or even sliced steak if you prefer! Personally, I prefer chicken thighs over chicken breast, because the higher fat content makes the thigh meat for more flavorful and just plain ol’ scrumptious after cooking. Those fats are also highly nutritious for our bodies and make chicken thighs a more satiating protein option. And they’re packed with loads of essential micronutrients! Steak can substitute just as well in this instant pot chicken fajitas recipe—just be sure to cut it into fajita-sized strips/slices before cooking. Again, I enjoy steak because it tends to be a bit higher in fat, making for a juicier, more flavorful meat in my fajitas. Whatever you choose—chicken breast, thighs, or steak—the pressure-cooking time and temperature provided in the recipe be the same! Add marinade ingredients to a large zip-top bag, seal, and shake to mix. Add sliced chicken, seal bag once more, and shake to coat chicken thoroughly with marinade. Refrigerate 1-2 hours, or up to overnight. 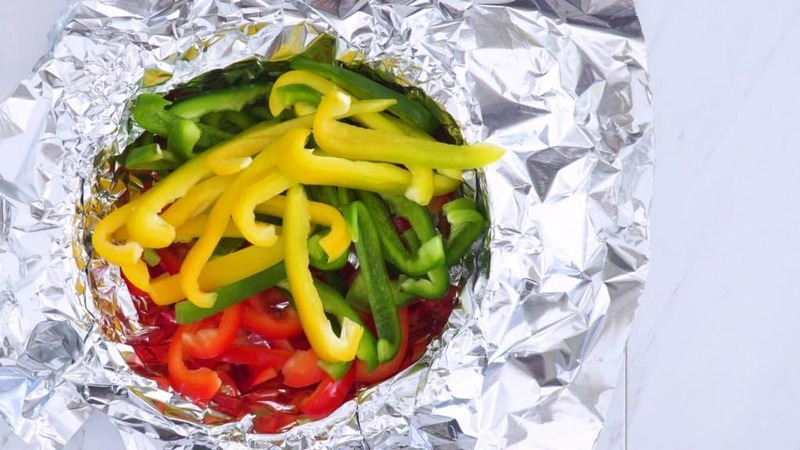 For fajita veggies, line a large bowl with a large piece of foil. Add sliced peppers and onions to the foil along with flavoring ingredients and toss to coat. 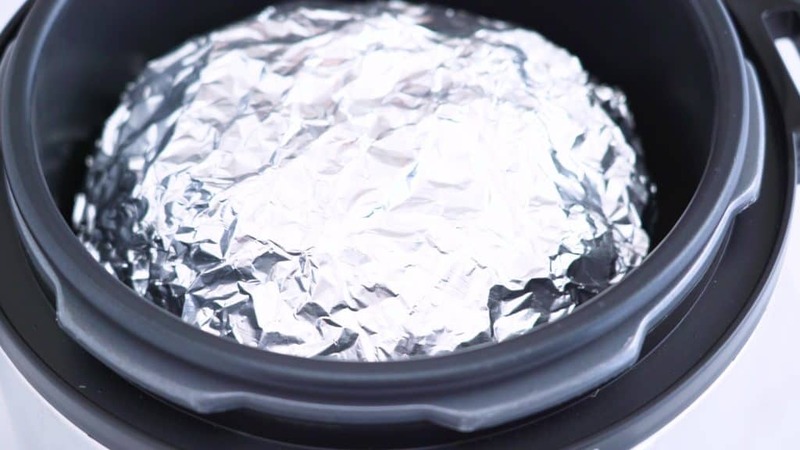 Fold over the edges of the foil to make a foil pocket. When ready to cook, pour chicken and marinade from bag into pressure cooker. Arrange in a flat layer on the bottom of the cooker. Place a steam rack into the bottom of the cooker (that’s tall enough so it’s not crushing your chicken), and place the foil packet of veggies onto the rack. Turn off heat and flip Quick Pressure Release switch to release steam for 6 minutes. Carefully open lid—watch out for steam! Use oven mitts or towels to protect hands while removing foil pocket and steam rack from cooker. Remove chicken using tongs or a spoon. 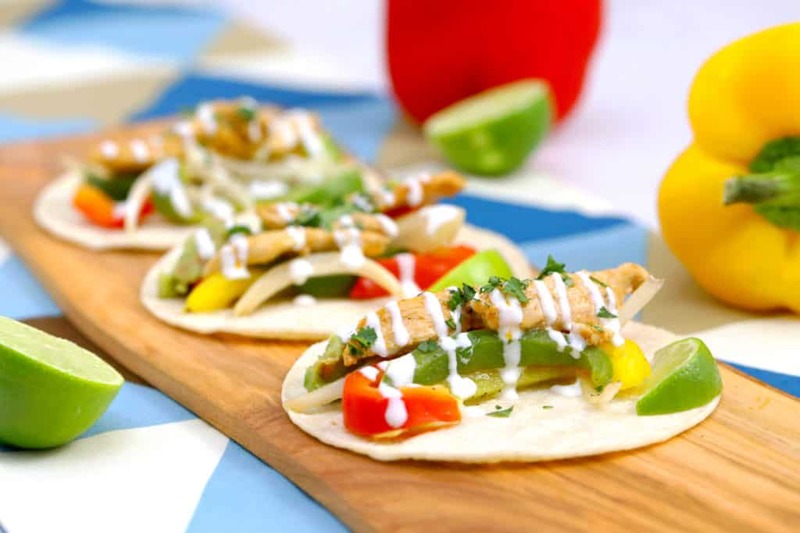 Serve on tortillas with your favorite fajita fix-in’s, serve, and enjoy! This recipe also freezes well after cooked! Allow cooked fajita chicken and veggies to cool completely. Place cooled chicken into its own large freezer-safe bag. (Or, divide chicken into individual portions and freeze in smaller bags, if preferred.) Remove as much air as possible, seal the bag, and label with the prep date. Freeze chicken for up to 2 months. Arrange cooled veggies in a single layer on 1-2 baking sheets—leaving some space between slices so they don’t clump. Transfer baking sheets to the freezer for ~1 hour, or until frozen. Remove trays from freezer and transfer frozen veggies into freezer-safe bags. (Either one large bag, or divide into individual portions.) Remove as much air as possible before sealing, and label with the prep date. Freeze veggies for 4-6 months. To reheat, transfer frozen fajita chicken & veggies (or desired portions of each) to the fridge to thaw ~24 hours before you want to eat. Heat until warmed through in the microwave or in a pan on the stovetop, serve, and enjoy! *I have a Crock-Pot brand pressure cooker, not an Instant Pot brand cooker. They both do the same thing, you’ll just need to know how to use the “manual” setting on whichever pressure cooker that you have. On my Crock-Pot pressure cooker, I access the manual setting using the “BEANS/CHILI” button. If you’re unsure about your machine’s manual setting, refer to its instruction manual or check out the brand’s website! *Nutrition accounts for marinade left behind in pot. Nutrition below provided for 1 serving(~6 oz) of instant pot fajita chicken and 1 serving (~1 – 1½ cups) of fajita veggies. Does not include optional tortillas and toppings. 2-in-1 Instant Pot Pasta Dinner: Healthy Instant Pot Spaghetti AND Meatballs Both Cooked at Once! Jackfruit Tacos - Vegan Meat!